NEW ORLEANS (CNS) — Louisiana ranks 51st — dead last among all states and the District of Columbia — in an index of nine “social justice indicators” that measure poverty, racial disparity and immigrant exclusion, according to experts from the Jesuit Social Justice Research Institute at Loyola University New Orleans. The report, called the “JustSouth Index,” measures every U.S. state in those areas of social justice but pays particular attention to five Gulf South states — Louisiana, Mississippi, Alabama, Texas and Florida — said Jeanie Donovan, economic policy specialist for the research institute, which announced the findings March 17. Finishing just ahead of Louisiana on the index among Gulf South states — but far down the national list — were Mississippi (50th), Texas (49th), Alabama (48th) and Florida (41st). Vermont earned the highest index score, followed by New Hampshire, Hawaii, Massachusetts, Connecticut and Virginia. In measuring poverty figures, the index analyzed average annual income, percentage of health care coverage and affordability of housing among the lowest 25 percent of income earners in each state. The researchers arrived at the racial disparity numbers by calculating the percentage of schools that are racially segregated in each state (with a student body composed of at least 90 percent of one race); the income gap between white and minority workers of similar age, occupation and experience; and the gap in employment rates between white and minority workers. The immigrant exclusion number was determined by the percentage of the immigrant population proficient in English after having been in the U.S. for at least five years; the number of immigrant youths who are not working or going to school; and the gap in health care coverage between immigrants and native-born Americans. “Each individual indicator” can be changed through legislative or policy decisions within each state. She mentioned a recent shift by new Louisiana Gov. John Bel Edwards to reverse former Gov. Bobby Jindal’s decision not to accept an expansion of federal Medicaid payments out of fear the state may be put on the hook for those payments down the line. 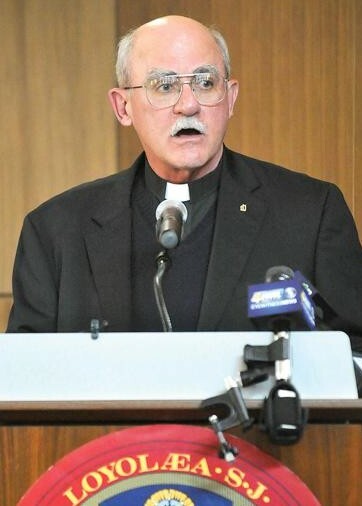 Jesuit Father Fred Kammer, executive director of the Jesuit Social Justice Research Institute, also called the expansion of Medicaid in Louisiana “a major factor” in Louisiana moving up the social justice scale in the near future. He also said the state should consider increasing the earned income tax credit to put more money in the pockets of low-income residents, and school systems should increase English as a Second Language opportunities and make it easier for immigrant children to assimilate to a new language by hiring more interpreters or those who are fluent in Spanish. At the news conference rolling out the report, Cristi Rosales-Fajardo, a native of Brazil who has lived in Louisiana for more than 30 years, said more liaisons are needed to help Spanish-speaking students and their parents navigate the educational system. Rosales-Fajardo, who speaks three languages, said Louisiana should follow the model of other progressive states by making sure homework is available in the student’s native language so that parents can help their children with their studies. She said the situation was improving slowly. “Before, a child could be sitting there an entire day with no one to support him at all,” Rosales-Fajardo said. Erika Zucker, a policy advocate for the Workplace Justice Project for the Loyola College of Law, said immigrant workers in Louisiana often fall victim to “wage theft” by unscrupulous employers who use their immigrant status to either withhold wages or pay them less than promised. Enforcement of wage theft cases is rare, Zucker said, and in the cases where the pro bono attorneys are able to get a judgment in the workers’ favor, the businesses or contractors vanish or declare bankruptcy, leaving workers unpaid or underpaid. Another tactic employers use with immigrant workers is to declare them to be “independent contractors,” meaning they do not have to pay payroll or unemployment taxes, which reduces state revenue. The practice also hurts the worker because he or she cannot file for unemployment benefits, Zucker said. Father Kammer said it will take political pressure to get elected officials to listen and respond to the issues the report uncovered. The full JustSouth Index report is available here.